Rare Lunar Eclipse To Offer Glimpse Of "Super Blue Blood Moon"
It's called a super moon because the moon, in its elliptical orbit, is near its closest point to Earth. Miami: Many parts of the globe may catch a glimpse Wednesday of a giant crimson moon, thanks to a rare lunar trifecta that combines a blue moon, a super moon and a total eclipse. The spectacle, which NASA has coined a "super blue blood moon," will grace the pre-dawn skies in the western United States, as the moon crosses into the shadow of the Earth and turns blood red. "Weather permitting, the West Coast, Alaska and Hawaii will have a spectacular view of totality from start to finish," said Gordon Johnston, a lunar expert at NASA. Other parts of the world, including Australia and Asia, will see it at night, as the moon comes up in the west. 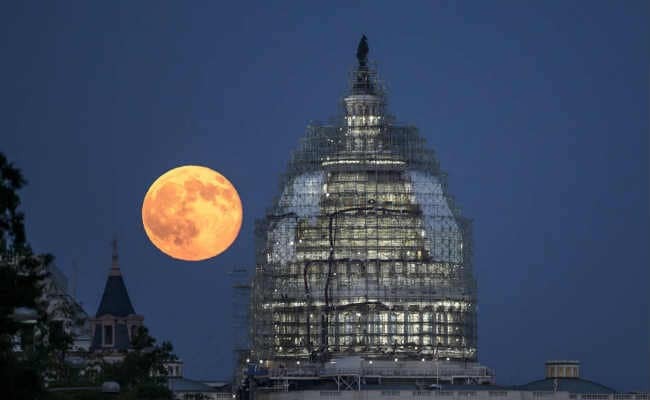 "The last time a complete lunar cover-up took place on the second full Moon of the month was December 30, 1982, at least as reckoned by local time in Europe, Africa, and western Asia -- locations where the event could be seen," said Sky and Telescope magazine. "The last 'blue moon' total lunar eclipse visible from the US and North America happened on March 31, 1866." The "blue moon" aspect simply means it is the second full moon in a month, not that the moon will appear blue. A blue moon happens on average just under every three years. This proximity, or perigee, makes it appear 14 percent bigger than normal and 30 percent brighter. The reddish tint -- or blood moon -- happens due to "the effect of all the sunrises and sunsets all around the planet reflecting off the moon, which I think is really lovely," said NASA astrophysicist Michelle Thaller. Sunrises and sunsets appear pink, red and orange because of the long distance light must travel, causing light waves to bounce in different ways, explained Thaller. "The reason a sunrise or a sunset is red is the sunlight has to pass through a large amount of air on the side of the Earth and that actually scatters away any blue light and just lets the red light come on through," she said. The blood moon will not be visible in much of Europe, Africa and South America. Viewing will also be a challenge for those on the US East Coast, since the eclipse begins just as the moon is setting in the west and the sun is rising in the east. But those who are not in the path of totality, or who are experiencing cloudy weather, may catch it anyway, via a live stream broadcast on NASA.gov. Moon-watching parties for the one-hour-16-minute eclipse were advertised up and down the US West Coast, including at Griffith Observatory in Los Angeles, where the gathering kicks off at 3:45 am. If you miss this one, the next blue moon total lunar eclipse will happen on December 31, 2028, though it won't be quite as large since the moon will not be at its closest point to Earth. Another will happen on January 31, 2037, a total of 17 hours before perigee. "The red color during a lunar eclipse is very distinctive and it's a rare treat to be able to see a blood red moon," said Brian Rachford, associate professor of physics at the Embry-Riddle Aeronautical University. "One of the great things about a lunar eclipse is you also don't need any special equipment to see it. Anyone can go outside and look at the moon."